A very special congratulations to Dr. Goldberg, Medical Director and Owner of Pima Dermatology, for being listed once again as one of the Best Doctors in America. He is featured in Tucson Lifestyle’s “419 Local Physicians” 2014 issue. With over 30 years of experience as a dermatologist and Laser surgeon, he is certified in more than 25 Laser modalities and has performed over 25,000Laser surgeries to date. 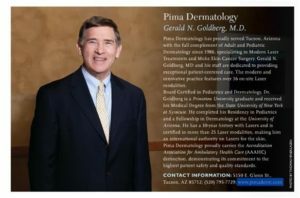 Dr. Goldberg is also a Clinical Professor of Dermatology at the University of Arizona and has been educating and training Dermatology Resident Physicians for over two decades. His tremendous dedication, sincere compassion, and unprecedented expertise are reflected by his constant enthusiasm to see patients each day -many who have been treated by him for years and even decades, from generation to generation.